The importance of female friendship is sometimes lost in our culture’s rush to celebrate love and romance. The endgame of fulfilment is seen to rest squarely on the shoulders of marriage, or at least a committed love-partnership, often referred to as ‘pair-bonding’. But when I look back on my life, the relationships that have been most sustaining have been those that fall quite outside the realms of traditional notions of love. When I first met Lou, we were both fourteen but she hadn’t gotten all her adult teeth. The remnants of childhood still hung about her, and I was drawn to the unselfconscious innocence of her gap-toothed smile. She was dreamy and whimsical, with large owlish glasses, and she wore little sprigs of jasmine in her hair. At fourteen I was already wounded, family tragedy having taken its toll, but there was a freshness to Lou, a lightness. I remember thinking—she’s just like me, only better. Funnier, kinder, more honest, undamaged. Lou said aloud all the secret things I kept to myself, strange thoughts or feelings I thought might set me apart. She didn’t seem to have a private self, she didn’t seem to need one. I loved her transparency, the freedom it afforded her, the freedom it afforded me in her company. Finding her then—in the midst of my strife-filled adolescence—was like surfacing from the depths of a dark pond into the soft daylight. A coiled up part of me unfurled in the sun. These days Lou’s face has settled into adulthood. She has a crease between her brows that I sometimes catch her smoothing, but I love the pensive thoughtfulness of her frown. It’s been over twenty years since we met, and in some ways she’s quite a different creature. The jasmine is gone, as are the owlish glasses, and when she speaks it’s with the hard-won wisdom of someone who’s been into the darkness and come out the other side. Life got to her, as it does to everyone. She hasn’t made it through unscathed. But when you love someone, the traces of their scars become beautiful, like a map of all the things they’ve been brave enough to feel. And though I’m afraid of middle age, I look at Lou and see how every day she becomes more luminous instead of less, and I hope it’s the same for me, that I’m mirroring her life-journey in some essential way. It’s hard to ascertain why some friendships thrive, while others fall away—the particular facets of compatibility or chemistry that must surely be at play. How it is that with some people you can feel such a potent sense of home. 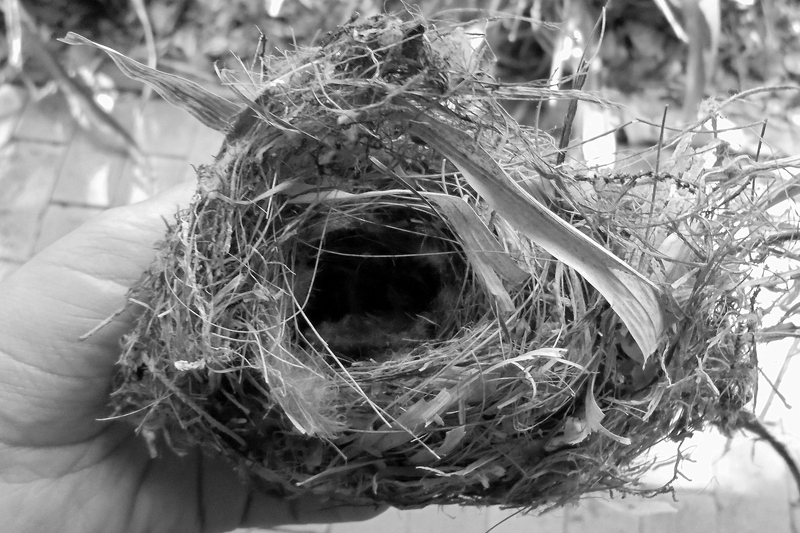 Lou once gave me a nest that she’d created from scratch, with a porcelain bird sitting in it. She presented it shyly—“It’s a little bit weird, I don’t know what I was thinking.” But for me, it was perfect. We weren’t pair-bonding, but we had built a nest—a safe place where we could hear each other’s most peculiar thoughts, try to keep warm one another’s dreams, and—maybe most importantly—where we could speak hard truths if they be needed. “He’s not good for you,” she said to me in a time of great confusion, not so long ago. “He’s making you sick.” I could feel her distress, how hard it was for her to get her tongue around those words. “I know you can’t stop, that he’s like an addiction, but I have to say it anyway.” And I was startled. It was the last thing I wanted to hear, but also unequivocally true. I stared, wide-eyed like an animal in the headlights. “You’re right,” I murmured finally. And she was. Her steady gaze an anchor in the wildest sea. We’ve lived through so many versions of ourselves—such a wide arc of changes—sometimes it’s hard to keep track of all the people we’ve been. And always her voice on the end of the line has that echo of the past, that thrill of trust and intimacy, that promise of endurance. First published in The Lifted Brow, Issue 25, 2015.